David Alexander LeBrun, age 17, of Rising Sun, MD passed away on June 23, 2009 at Christiana Hospital surrounded by family and friends. David was born on July 16, 1991 in Newark, DE to Alan D. LeBrun and Marguerite Ruello LeBrun. 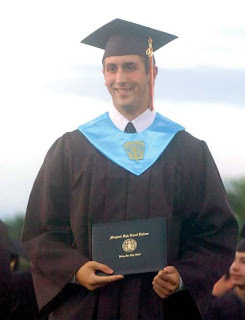 He was a graduate of the Rising Sun High School Class of 2009, a member of the National Honor Society, Maryland Mathematics League, a finalist for the National Merit Scholarship Award, a Maryland Distinguished Scholar Semi-Finalist and he received the Rising Sun High School 2008-2009 Scholar Athlete Award. David planned to attend the University of Scranton on a full academic scholarship. He was on the All County Baseball and Basketball Teams and was the 2008 All County Baseball Player of the Year. David was a member of the Cecil Legion Baseball Team in 2007 & 2008, winning the State Championship in 2007. He also led the Rising Sun Little League Junior Baseball Team to the state title in 2006. David was a talented student and athlete, he loved baseball and basketball, was a team player and did everything he could to motivate his teammates. He enjoyed spending every minute possible with his girlfriend Michelle, brother Josh and with family & friends. He also enjoyed math, music, reading and helping others. David made a big impact on everyone he met; he was a caring and kind person and loved by all. One day after suffering a brain aneurysm, David LeBrun, 17, officially passed away at 11:53 a.m. on Tuesday. He was kept on life support until 7:23 p.m. to allow friends and family time to say goodbye. During the past two days, hundreds of people flocked to Christiana Hospital in Delaware in support of Dave LeBrun. She said the viewing will likely be at 4 p.m. on Friday with a funeral on Saturday. Full details will be completed today. My heart is breaking. I'm typing this through tears. A friend of mine has lost her son - her baby. Outlined above, David LeBrun was a bright person. He JUST graduated from high school. His mother was planning his graduation party for this weekend, instead she has to plan a funeral. Then on Monday evening, David suffered a massive brain aneurysm. Marguerite found him in the kitchen. I received the call from a mutual friend of ours about this yesterday, early in the morning, while I was at work. I called Marguerite afterwards to see if she was okay, and she broke down on the phone with me. I made sure she wasn't alone, and asked if she needed anything - but what can I really do? They were waiting to see if there was any brain activity. I read online later that they had declared him brain dead. What a shame. I met both of her boys once - my kids and I went to a basketball game to watch them play. Both of the boys were into baseball and basketball and excelled at what they did. I prayed for her, for David, for the rest of their family, and I just read on the Cecil Whig that David passed away last night. I am a Christian. We all know that it is okay to question, but do not lose faith. I am questioning. Why, Lord? Why did you take this bright young man away? He had so much to look forward to - such a great life he could have had. Marguerite - You are my friend and I am here for you. I'm so sorry you lost your baby. I know how excited you were for him as he moved onto college this fall and then on to bigger and brighter things. I am sorry for your Friends Loss! what a Beautiful young man! I sit HERE Crying! I lost my brother at age 34 and that was too young.. why? Only God knows why and there are NO words. Please accept my sincere thoughts and prayers for this family!!! I am a Christian too! Don't loose the Faith. We do not have the Answers... and yest it is ok to question. How awful! Sending prayers their way. I'm so sorry for their loss! Oh my heart breaks...We just had graduation ceremonies yesterday! Wow. I can't imagine what it is like to lose a child. I will pray for your friend's family. That is so heartbreaking. My thoughts and prayers are with his family during this difficult time.